I am not a Stampin' Up! 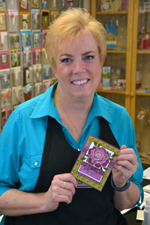 demonstrator to sell stamps, go on vacations, or spend hours cutting cardstock. I do it because I love to meet new people and see how excited they get when they see what they can do with stamps. My favorite thing is to have someone reluctantly come to a class or Stamp Camp thinking that they don't have a creative bone in their body and that they are going to be miserable for the next couple of hours because they "hate this kind of thing" only to discover that they LOVED it. Some of my best stampers are the ones who didn't want to stamp and had no interest in doing it. They've been with me for ten years now and never miss a class. 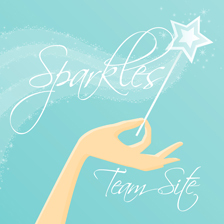 Some even signed up for my Sparkles team! You just never know where life is going to lead you and you should never pass up the opportunity to learn something new. Here are just a few of the new faces I met this week. Incredible women (and one very brave man) that I hope to meet again and someday introduce as friends. I'm starting a Technique Club! You can join us in my stampin' garage and use my supplies or have a kit sent directly to your door. Each month you will receive 3 technique pages with complete step-by-step instructions, 3 card projects using the techniques, a shopping list and a 10% discount on class supplies. This is a great way to learn a huge variety of stampin' techniques, have fantastic cards to send to your family and friends, plus create a book of instructions to help you remember exactly how the cards were made. How many times have you gone to Stamp Camp, loved the project and can't remember what you did? This technique book will last you lifetime and will help you create project after project of wonderful designs. Here's a sample of a technique page and card to give you a hint of what you have to look forward to as a Club Member. Email me at Stampwithjeanne@cox.net to find out more! Here's a sneak peek at some of this month's Stamp Camp projects. 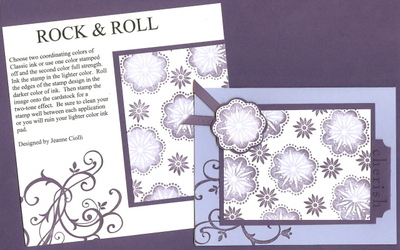 We're making a total of 15 cards out of the Rose Cottage Simply Scrappin' kit. If you can't join us at Camp, you can purchase a kit for $25 (plus shipping) and recreate these beautiful cards in the comfort of your own home when it suits you. Enjoy! I've mentioned that I'm having a big Stampin' Party on October 13th. Just thought I'd tease you a little with a picture showing some of the cards that will be available. All of these cards were made from the Sending Happy Thoughts Simply Sent kit. The more I use these kits, the better I think the value is. 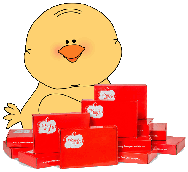 You get everything you need in one cute, little box! Stampin' Up! 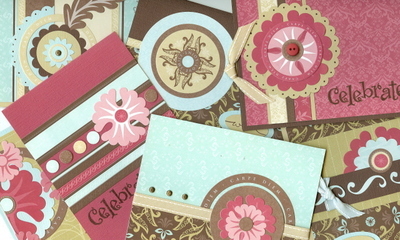 is celebrating National Card Making Day on October 6th with a special sale. All of the Simply Sent kits will be offered at a 20% discount October 4th thru 8th. Some friends and I got together and designed some fantastic cards out of each kit. When you purchase your kit from me, you will receive step-by-step instructions for all of the additional projects as a bonus. These cards were designed by Cindy Manzanares and I love um! I'm so lucky to be able to share Cindy's creative talents with you all. Thanks Cindy! Simply Sent Kits...Talk about convenient! 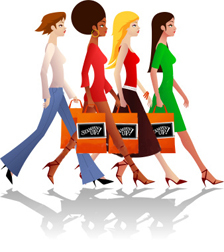 Have you noticed the 5 fabulous Simply Sent Kits in the Fall/Winter Catalog? They can be found on pages 12-14. These are the best! I just love the convenience of having everything you need to make a variety of greeting cards all wrapped up in a cute, compact package. Even though I already have all of the ink colors in our large inkpads, getting the Stampin' Spots is great because they're so portable and easy to color with. If I'm going on vacation or anywhere where I know I'll have to wait, it's easy to bring these along and time will fly by when I'm stampin'! Speaking of flying...I take these kits on the plane with me too. The stamps, cardstock and ribbons are already pre-cut, so I don't have to worry about being busted for carrying scissors going through security. Oh, here's a tip for you...don't ever try to carry peanut butter through airport security. They get nasty about it...sheesh! So, back to the kits...there's also step-by-step instructions for 2 great projects and special adhesives like glue dots or Stampin' Dimensionals. You will need to have SNAIL or a glue stick on hand. Aren't these fun? If you order any of the Simply Sent kits from me, I'll be happy to send you step-by-step instructions with pictures for a variety of cards you can make out of the products provided as a bonus. I had the best birthday! Every time I turned around there were more and more beautiful cards being sent my way! At Convention the group I was with got together and planned to bombard me with birthday cards! It seemed like every hour I received at least 7 more fantastic cards. It was GREAT! 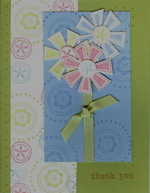 I loved so many of the designs that I decided to share some of them at Stamp Camp this month. 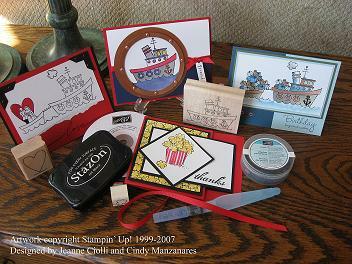 Thanks to Ida Colvin, Dianna Kerns, Marianne Dawes and Shirley Dryden planning my August Stamp Camp projects was a snap! I just CASE'd their beautiful designs! Here's the cards we'll be re-creating this month. 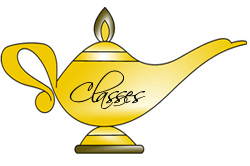 If you would like to join us for the fun, check out my online calendar for details. In a couple of days I'll be packing my bags, stampin' tools and junk food headed for Denver, Colorado. It's Stampin' Up! Convention time!!! Woo-hoo! Convention is one of the reasons that I love being a Stampin' Up! Demonstrator. Imagine, thousands of crazy stampin' women hootin' and a hollerin' for 3 exciting, insane, sleep deprived days! We stamp, we bond, we cry, we laugh and most importantly make new friends from across the Nation and around the world. The longer I'm a demonstrator the more exciting Convention is because I get to meet up with incredible, fantastic women that I've had the opportunity to get to know over the past 4 years. 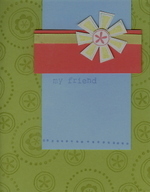 Most of the close friends that I have now are people I've met through Stampin' Up! I never knew my life would be blessed in so many ways when I decided to join the Stampin' Up! family. Becoming a Stampin' Up! Demonstrator is one of the best decisions I've ever made. A huge part of Convention in swapping cards, scrapbook pages and "Wow" projects. I can't even describe what being on the trade floor is like. Trust me, the New York Stock Exchange has nothing on us when it comes to frenzy and enthusiasm! Dennis has been on 3 Stampin' Up! cruises with me and has decided that we're a cult, lol. Just walk up to Dennis and yell, "Stampin'!". If he doesn't say, "Up!" back to you, I'll give you a free card! This is one of the cards I've designed to trade with the masses. I completed 96 of these babies and will do my best to swap for cards that will inspire your creativity. 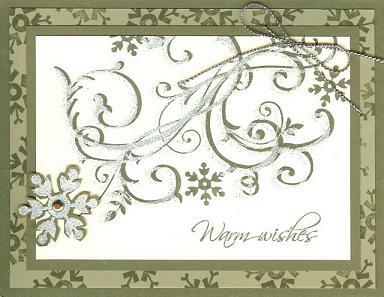 This card uses the Bold Snowflakes Jumbo wheel, the beautiful Baroque Motifs and the Hugs & Wishes stamp sets. Featuring the Faux Emboss technique with Hologram Highlights and White embossing powder the card sparkles in a way you can't see in a picture. Some of you are probably wondering how I was able to stamp the snowflake designs individually when they're on a wheel. Easy! I removed the rubber from the wheel and mounted the designs separately on blocks of wood. I was able to get 8 stamps for only $7.95! I was lucky enough to have wood blocks available, but if you don't...go to the Dollar Store and buy a set of building blocks. They come in all sizes and are just right size for mounting your stamps. You can mount fun foam under the rubber with rubber cement for the cushioning. Keep this in mind any time you see a wheel design that you think would be great as individual stamps. I'll be doing this with the All About Birthdays, All About Christmas, All About Gratitude, and Neighborhood wheels for sure! When I first opened our new Fall/Winter Catalog I knew I was in trouble. I was so impressed with all the new stamp sets and accessories that I figured I needed to get an extra job just to pay for the ones I wanted. I had a hard time finding a stamp set that I really didn't want, I mean NEED. There's always a few sets that I can live without, but this time it was tough. The first stamp set I knew I'd be purchasing is the Boatloads of Love set. I think this little boat and the sayings are so darn cute! I quickly chose this set as the one I'd be featuring for my August Card of the Month projects. Cindy and I had a great time designing these cards together last night. For those of you who don't know, Cindy is my upline and is one of the most fun people I know. She always makes me laugh! I so appreciate that she meets with me once a month to stamp. I always want to keep adding more and more to my designs and Cindy keeps me under control. If all the cards were in my style it would take you hours and hours to complete the projects. Eventually, you would have to move in, lol. 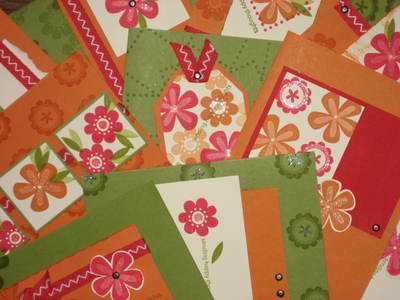 Cindy keeps reminding me that the Card of the Month projects are supposed to be easy to duplicate. Thanks Cindy for all that you do to keep me inspired. Your support means so much to me! These cards are what we came up with for COTM. Of course, I had to add the "Out of the Box Thinking" card and came up with making popcorn out of the cloud stamp. This will be one of my Convention trade cards if I can get my act together in the next couple of days to make them. We thought it would be cute to use this card to hold a gift card or movie tickets. If you would like to purchase the August Card of the Month kit to create these cards, let me know!